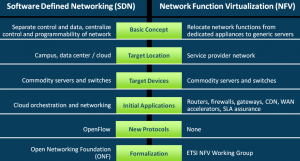 SDN/NFV: What’s Motivating the Development of SDN and NFV? There is much overlap in the solutions that these technologies provide; but all are directed to the goal of better network utilization through faster provisioning. The approximate relationship of these new technologies is shown in Figure 1. 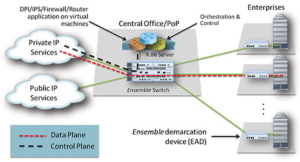 In this article we shall concentrate on SDN and NFV. The boundary between SDN and NFV is rather fuzzy, but both utilize the concept of virtualization, and both employ generic high-performance hardware that can be purchased inexpensively and in large quantities. This hardware is called “white boxes” or “bare metal”. White Boxes or Bare Metal. These are generic computing and switching elements that utilize components that can be manufactured inexpensively and in large quantities, such as CPUs and memory. They are designed to operate at extremely high speed and to be configurable under software control. The difference between this hardware and standard devices from Cisco and other manufacturers is that these white boxes come with an operating system but not the usual (proprietary) control and switching software/firmware. They usually rely on open source software to configure and operate them. Note that SDN is an infrastructure technology, used by carriers and ISPs to build better networks, just like DWDM. It enables better, faster provisioning of services. 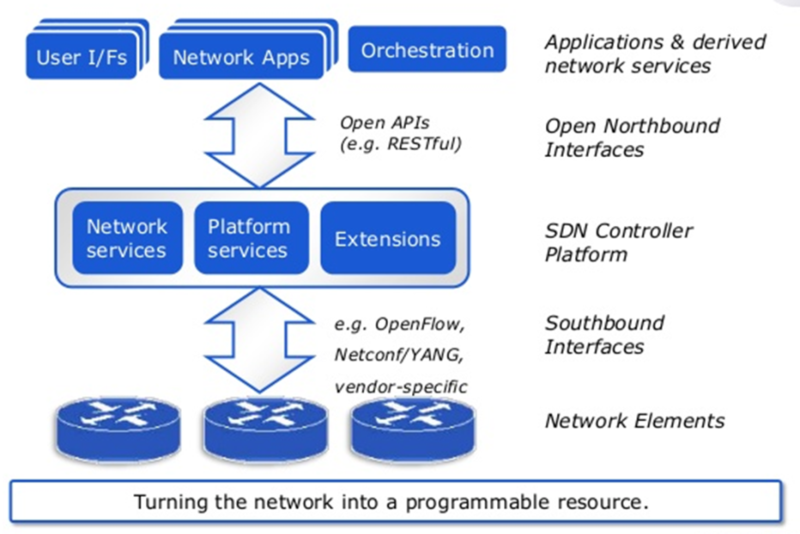 It is not an end-user service—you can’t buy SDN, only services enabled by SDN. Flavors of SDN. 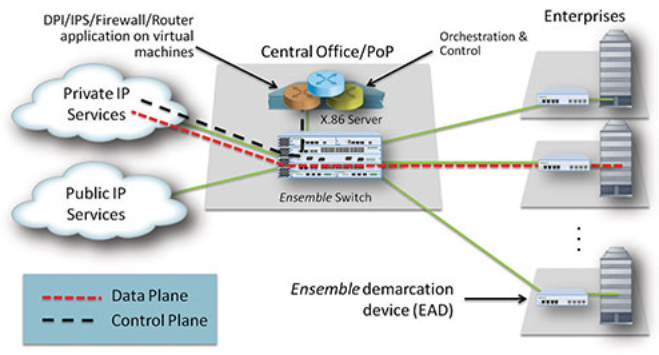 SDN can be implemented in the Wide Area Network (WAN) or the Data Center. We will consider both. 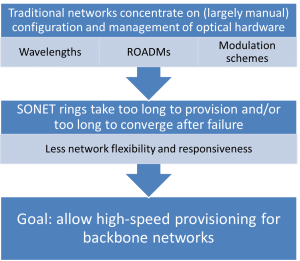 WANs or backbone networks have the goal of delivering connectivity to lower level entities such as Internet Service Providers (ISPs). In today’s environment, there is often a need to quickly add or change service. 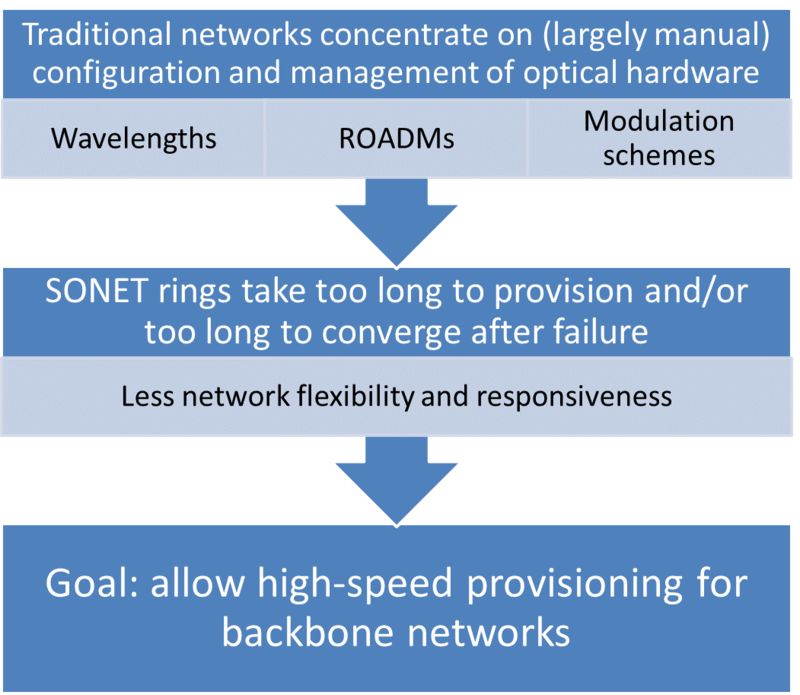 But networks based on older technology, such as SONET, are not well suited to this, as shown in Figure 3. 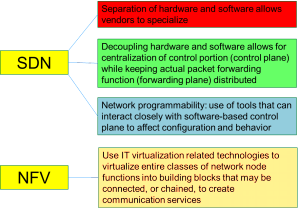 SDN in the WAN seeks to address this by giving network operators the ability to manipulate critical network parameters under software control. 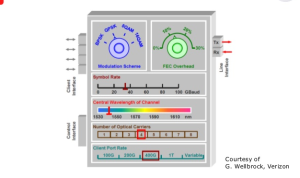 An example of this ability, the “SDN Cockpit”, is shown in Figure 4, which would enable operators to modify modulation schemes, symbol rates, wavelengths, and so forth. We are, however, not there yet. In addition, network vendors need the ability to reconfigure their networks quickly, and this comes from virtualization of switches, routers, and other network devices; but that shades into NFV, which will be covered later. 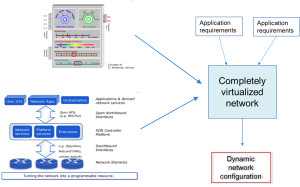 The idea behind SDN in the Enterprise data center is to leverage virtualization and white boxes, as well as utilizing the distinction between network planes. Network planes are a way of logically separating network functions in order to facilitate network control and configuration. 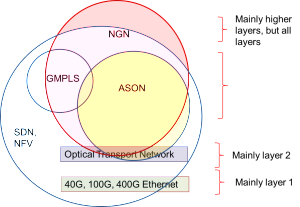 Refer to Figure 5, which shows the three planes commonly used to discuss network functionality. The Control plane is abstraction of all programs that control a network, including routing, monitoring, route calculation, fault handling, and provisioning. The Data or Transport plane is the hardware that actually does the work, including switching, framing, and low-level error control. 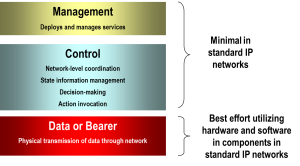 The Management plane decides overall network policies, including pricing, services offered, and performance specifications. The basic idea of SDN in the data center is quite simple: Each application “sees” a network configuration based on how the network hardware looks to it. This is a “virtual network” in the sense that the actual hardware constituting the network is not visible to the application, only the pathways open to it, including speeds, reachable locations, and resources such as storage. The Control Plane knows about each application’s needs. The Control Plane sends signals to the Data Plane to reconfigure switches or other hardware to meet (or better meet) all application needs. This logically (but not physically) reconfigures the network, so that the new network looks like a different physical network to applications, including networked resources such as storage. That is, no cables are changed, and no new hardware is installed. Only packet routing, storage, etc. are changed under software control. So with this kind of virtualization, the application “sees” a different network, and the application’s data flows through the network now get expedited, or it has access to more storage, for example. 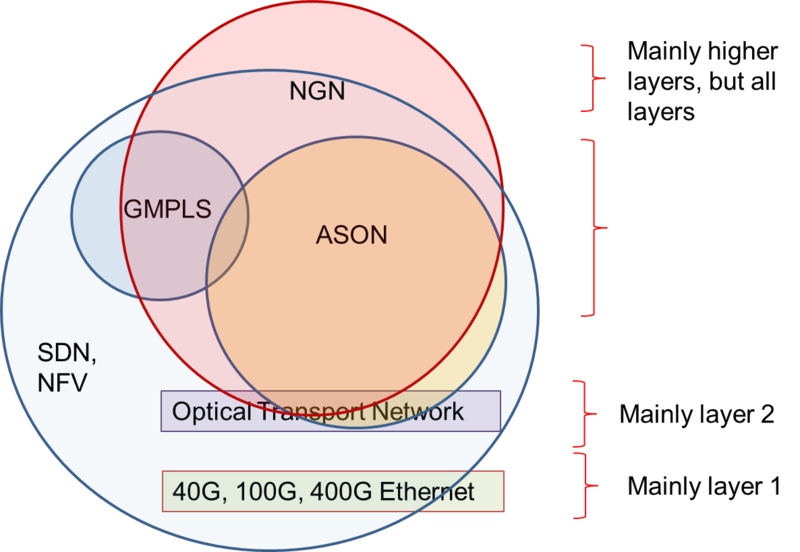 Refer to Figure 6, which shows how the SDN elements sit between applications and underlying network hardware. 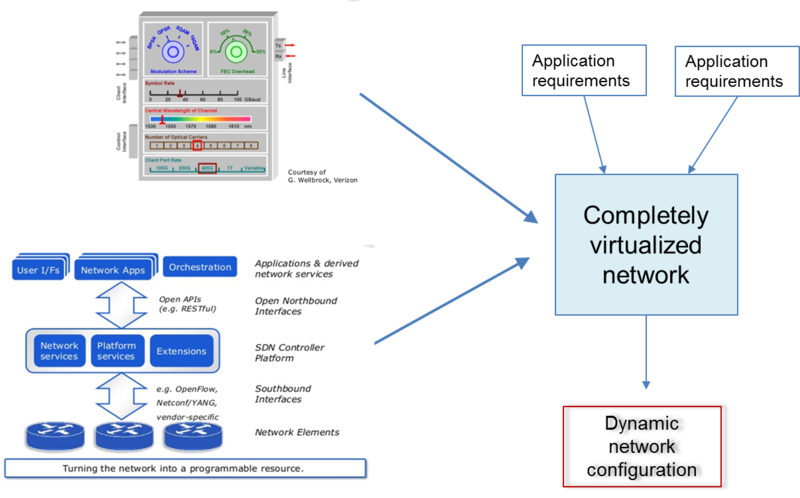 The interface between SDN controllers and applications is called the “Northbound Interface”, and that between the SDN controller and the network hardware is called the “Southbound Interface”. 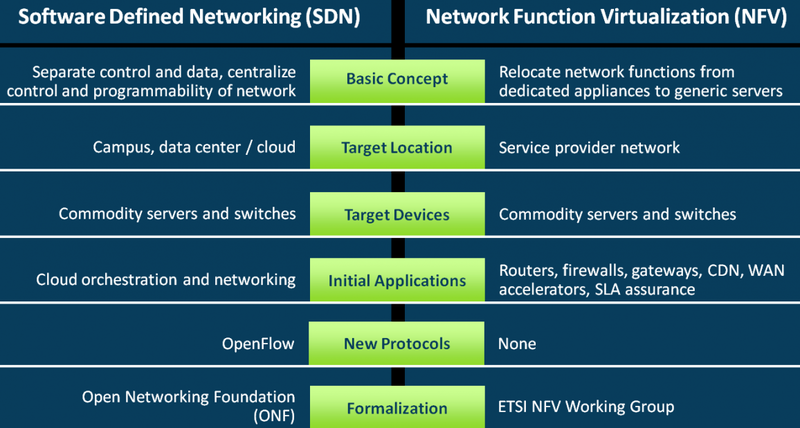 As indicated above, SDN operates on “flows”. A flow describes a set of packets transferred from one network endpoint to another, which could include TCP/UDP port pairs, VLAN endpoints, or L3 tunnel endpoints. Most networks and data centers have a set of flows that includes most of their workload, so use of flows to control the network or data center configuration makes sense. 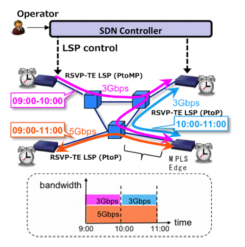 In the case of SDN, a flow table is put on each packet handling device (SDN controlled device). When a packet comes in, flow table lookup is done to determine action. 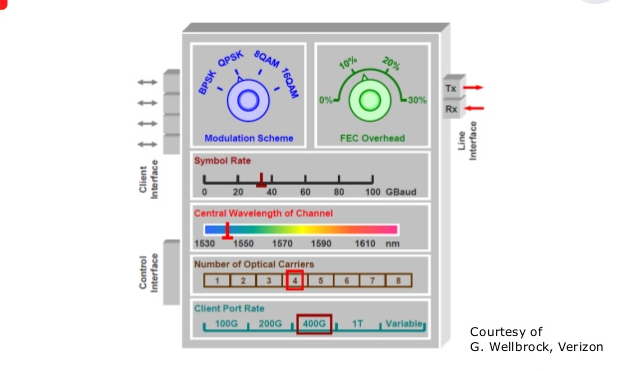 This is analogous to label switching in MPLS, and is done at line speed. In this way data is switched through the network. Separately an SDN controller calculates (and optimizes) flows and flow tables, based on knowledge of network capability and application needs, though this is not done at line speed. OpenFlow is a public domain protocol that is often used as the network management protocol in SDN installations. Refer to Figure 7. OpenFlow works by modifying a switch’s packet forwarding tables: adding, modifying and removing packet matching rules and actions. Routing decisions are made periodically or ad hoc by the SDN controller. They are translated into rules and actions with adjustable lifespans, and deployed to switch’s flow tables. Actual forwarding of matched packets is handled at wire speed by switch for duration of the rules. 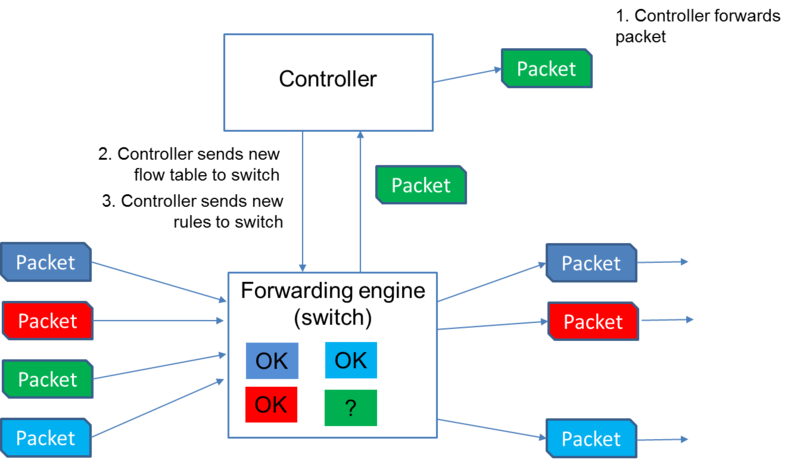 Unmatched packets (packets for which no flow is assigned) are forwarded to the SDN controller, which must determine what to do with the packets. Figure 8 shows the action of the controller and switch. Another scenario involves a merging of local (data center) and WANs, as resources required for application become more scattered. The growth of cloud computing (actually much more than computing) also feeds into this model. 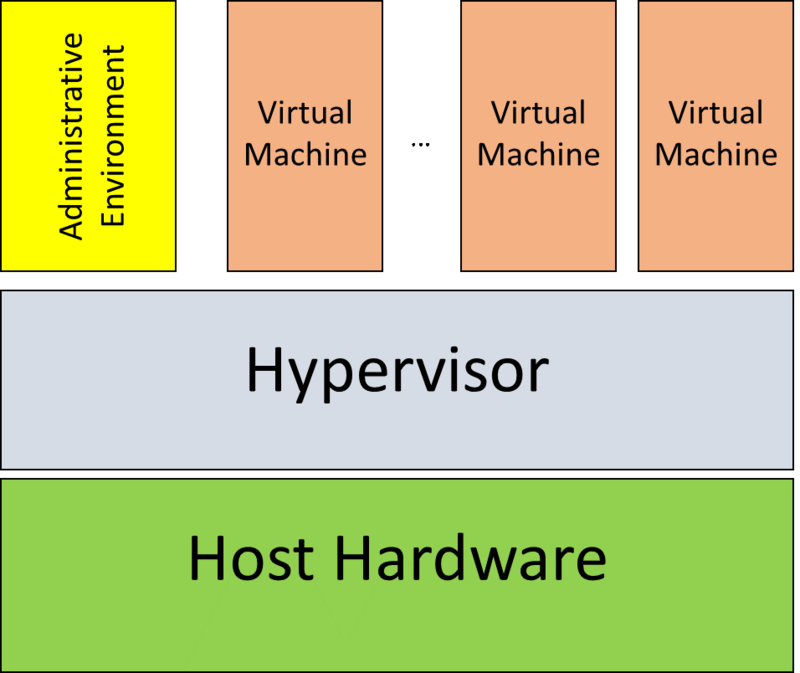 In this scenario, all network resources are virtualized and controllable, as illustrated in Figure 10. 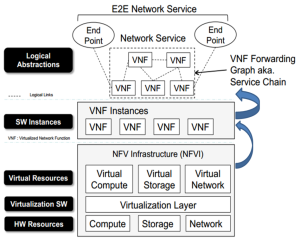 NFV concentrates more on network functionality. 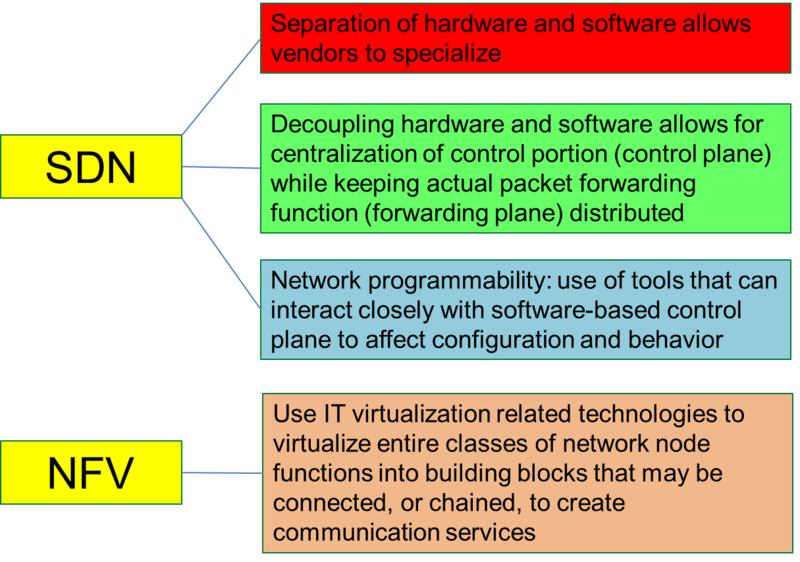 As with SDN, its name is appropriate: Network Functions Virtualization uses virtualization of network components to create functionality. To put it simply, white boxes or bare metal are used to carry out key network functions such as switching, routing, and firewalls under software control. These virtualized devices can be chained together to create communications links and services. In this way, by virtualization of this functionality, a network can be reconfigured quickly and new services provisioned rapidly. 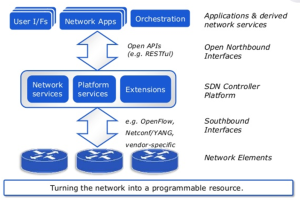 NFV’s relationship with SDN is shown in Figure 11. 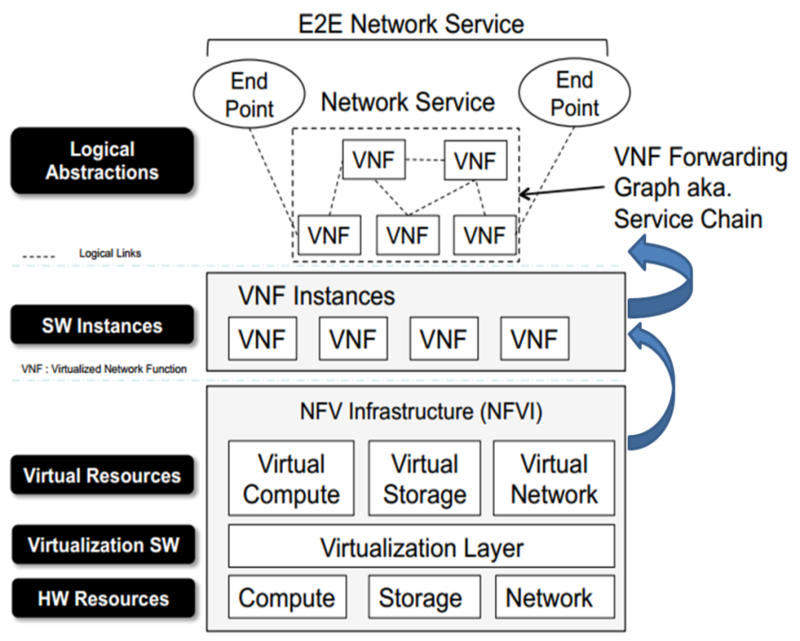 See Figure 12 for a view of NFV as virtualized network appliances. Service function chaining is how virtualized network services are assembled into a desired network service. First define an ordered list of a network services (e.g. firewalls, NAT, QoS) needed by a customer or group of customers. These services are called “Virtual Network Functions” (VNFs). They are “stitched” together in a network to create a service chain, i.e., a path through which packets with a certain tag flow. 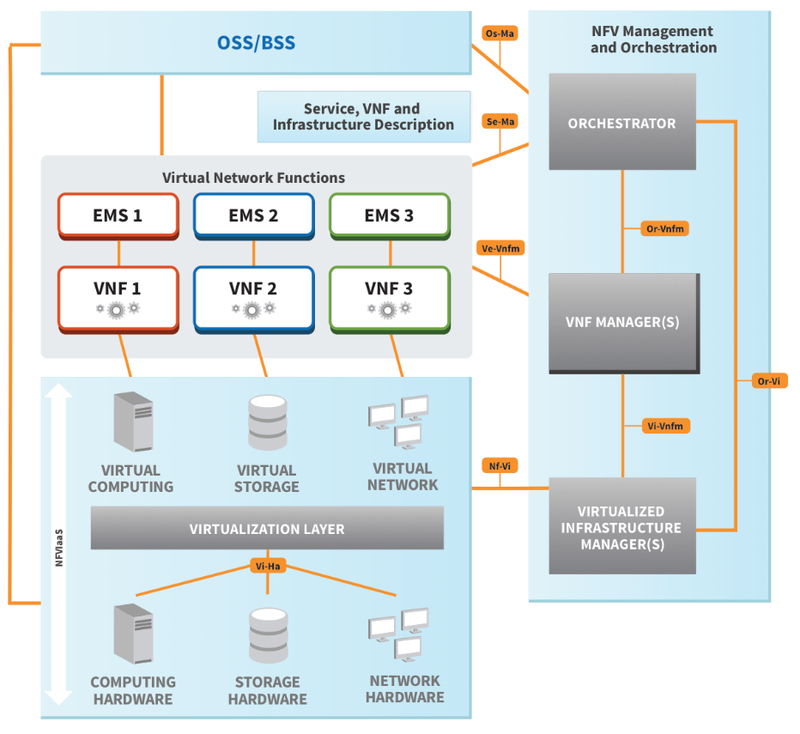 The VNFs themselves are created through virtualization, with a virtualization software layer on top of underlying physical hardware, and through use of white boxes. This is illustrated in Figure 13. 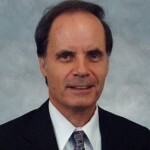 The European Telecommunications Standards Institute (ETSI) has done much of the development work on NFV. Their “reference architecture” illustrates the basic components of an NFV installation. It shows the Operational Support System/Business Support System (OSS/BSS), which utilizes the virtualized functionality, the virtual network functions, and the virtualization layer that turns physical hardware into virtual functions such as computing, storage, and network connectivity. 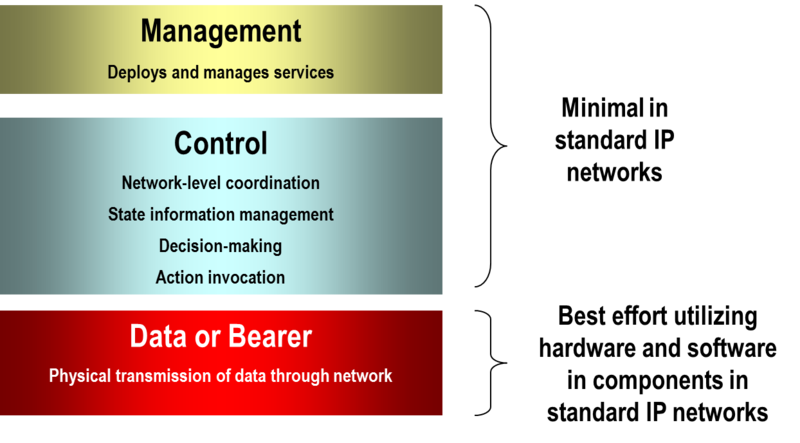 The Management and Orchestration component, known as “MANO”, is what controls the virtualization and thus the functionality seen by users. 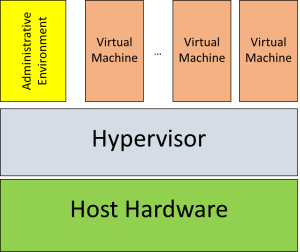 The reference architecture is shown in Figure 14. Note that practical implementations do not always separate the functions shown in the MANO. Consider the case of an Enterprise service consisting of managed router and managed VPN, as shown in Figure 15. If additional service are needed, the Service Provider dispatches a technician on-site to install, configure, and test the new device(s) needed, e.g., new firewall. With NFV, matters are much simpler and faster. The IT manager logs onto a self-service portal and orders the additional managed firewall service. The NFV software takes it from there: portal sends a service order to the NFV system, which installs firewall virtual function on an available virtual machine in the central office or PoP. It reconfigures metro aggregation switch to steer appropriate packet flows to virtual function, and updates billing record in back office billing system, as shown in Figure 16. SDN comes out of large-scale IP infrastructures. It is intended to establish and exercise central control over packet forwarding, simplify traffic management, and achieve operational efficiencies, primarily in a large (Enterprise-scale) data center. It utilizes an open networking environment and elements such as switches, servers and storage configured and managed centrally. These elements run on standard hardware components (“white boxes”). There is separation of network control logic from physical routers and switches that forward traffic. 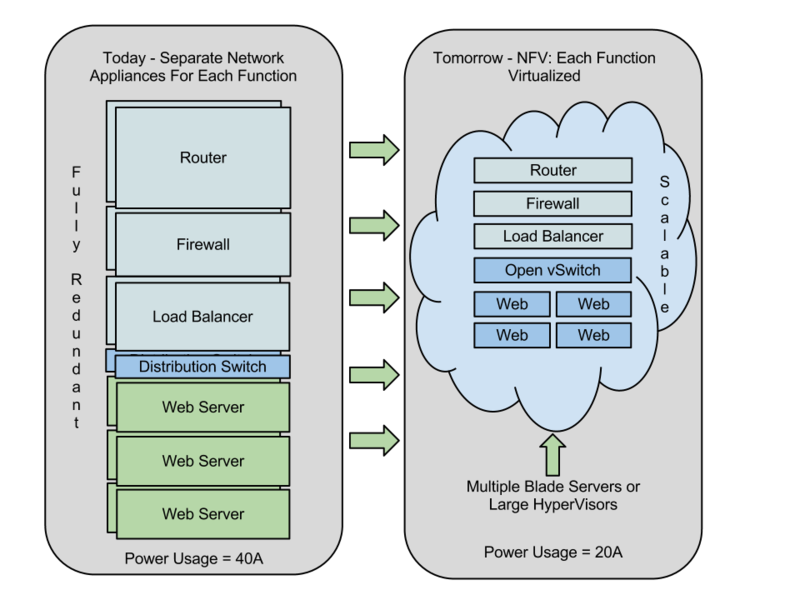 NFV Originated from SDN. It was developed for service providers interested in facilitating deployment of new network services. 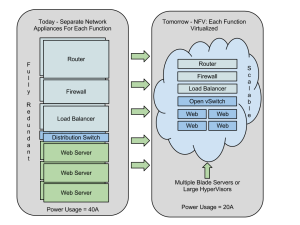 NFV virtualizes networking devices and appliances. The goal is to avoid proliferation of physical devices to fill specialized roles such as routing, switching, content filter, spam filtering, and load balancing. The virtual implementations provide important network functions instead of specialized physical devices. The goal is to achieve WAN acceleration and optimization, reduce development/deployment costs and risks, and handle unified threat management. The current relationship between SDN and NFV is summarized in Figure 17. In the future, as discussed earlier, the functionality of these two will likely merge. In fact that trend is well underway with large-scale providers such as Google and Amazon. SDN and NFV have been developed to help meet the challenge of increasing demand for services and user expectation of rapid provisioning and universal availability. Both rely on virtualization, the ability to make a piece of equipment look like another via the magic of software. What makes this cost-effective is the availability of inexpensive but powerful computing units that can easily be programmed to take on many different functions such as switches, firewalls, and routers. SDN was originally developed to address the problems of large data centers, where virtualization of hardware and operating system is important (think cloud computing). It will likely spread to other areas, including the WAN, where virtualization and the ability to dial up bandwidth and related characteristics would be extremely valuable as well. NFV is an outgrowth of SDN in many respects, concentrating on backbone networks, where the need to rapidly reconfigure resources is key. Both SDN and NFV are conceptualized in terms of planes, i.e., the control plane or the hardware/software that configures and controls a network, the data plane that does the actual work, and the management plane that sets network policies such as services offered, performance specs, and pricing. 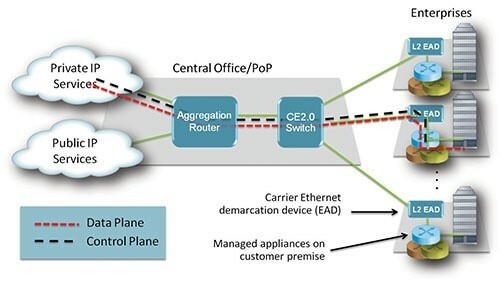 The control plane looks to optimize network flows, and creates new ones when needed. It can also define new services using existing resources or by reprogramming hardware. SDN and NFV are here to stay and grow and may ultimately merge into a unified means of creating, controlling , and allocating network resources from the LAN to the WAN. Editor’s Note: Eogogics offers courses on SDN and NFV as well as related areas of Cloud Computing and IP networks. We also offer market intelligence research publications on SDN, NFV, and related topics.